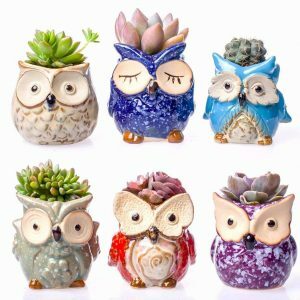 Ceramic Owl Succulent Pots Deal On Amazon! Are you looking for some decorative pots for your plants? These are a fun little set to keep your plants in and have room decorations. Mini planter pots made of ceramic materials perfect for holding succulent,cactus plants,herbs or other small plants. Each owl pot is with unique design.You will get 6 distinct owls with their own personality,look and color. Owl are designed by Claywa team,you will find nothing like these owls elsewhere. Inside of those planters is non-glazed,good for plants breathing and grow.Each pot features a hole at the bottom for water drainage,packed with 6pcs mesh pad to stop soil leaking out.